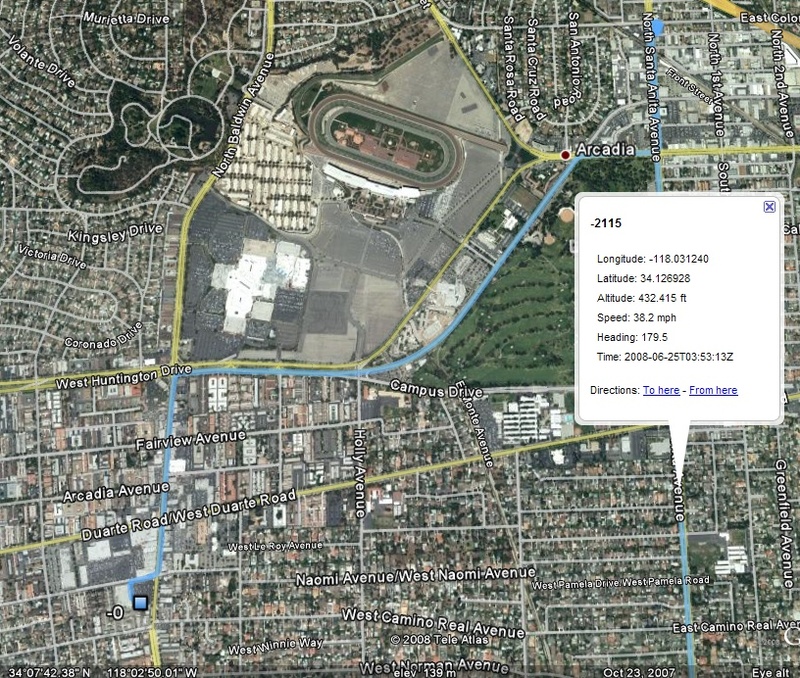 Last year, I wrote about my geotagging workflow with the Amod AGL3080 GPS Data Logger, Lightroom, and GeoSetter. Since I’ve been doing it for nearly a year, I felt compelled to write an update. Copy photos to my “To geotag” folder on my Drobo. If you don’t have that GPS data logger, you might need GPSBabel. GeoSetter defaults to somewhere in Germany. If you take photos around a few places regularly, and you’re not using a GPS data logger, create a favorite at that location. For example, when I’m going to and from work, I’m usually around Los Angeles Union Station, Koreatown, and Sierra Madre Villa Station in Pasadena. So, I made favorites for those spots. Sometimes, the server won’t connect. An annoyance in which you have to wait until it does. Any ideas or solutions for this one? Since I want to have my photos geotagged on my computer (before uploading to Flickr and/or Bryan Villarin Photography), I don’t edit any of them in Lightroom until that step is done. The “Read metadata from file” step [in Lightroom] will overwrite the metadata with the one saved from GeoSetter. Do you still use the Amod AGL3080? Yes, and it’s still a champ. I wouldn’t see any reason to go with another one. What if I don’t have a GPS data logger? Get the Localize bookmarklet. You’ll love the place/address search. So, if you’re photowalking, bring pen and paper, then write your location every few minutes (e.g. Wilshire and Normandie, Los Angeles). After you’ve uploaded your photos, refer to your notes and geotag accordingly. It’s a slick way to see where you’ve been. You might also want to revisit a place or inspire others to check it out. Of course, don’t geotag where you or your friends live. Be safe. What did I miss? Share your suggestions with everyone else! After my trip to my Hawaii, I finally realized how much I want a GPS data logger for geotagging. So, after the TWIP recommendation for the Amod AGL3080 GPS Data Logger and a bit of reading, I decided to buy one. Oh yeah, it helped that Semsons is literally a mile from me — and they allow for pickup! That saved me eight bucks. Note: I’m not affiliated with Semsons. I bought the device with my own money. I went for a drive to get some ice cream, then In-N-Out. I took a few photos while I was out, of course. Back at home, I plugged in my Amod AGL3080 and copied the log file to my desktop. I ran the GPSBabel (GUI) to convert the log file so GeoSetter could read it. Set the input format to NMEA 0183 sentences, choose the log file on your desktop, then choose an output format and new filename. For GeoSetter, choose GPX XML. Import your photos into your Lightroom as usual. I don’t use the DNG format right now — I keep the original RAW files and use XMP sidecar files. Your last step in GeoSetter is to save that data to the XMP files. Ctrl+S does the trick, backs up the original XMP files, and writes the new ones. Finally, in Lightroom, select the photo(s) you just geotagged in GeoSetter, right-click and go to Metadata > Read metadata from file. It’ll throw up one last warning, but you’ll be fine — click Read. Now, if you look at the metadata on the right pane (Loupe View in Library), Location should be filled in. Also, notice the plethora of additional keywords? Flickr can read this and I’m sure Picasa Web can, too. Now, process your photos like normal. When you export your geotagged photos to JPEG and upload them to Flickr, they’ll already be geotagged. Please look at the sources for Mac solutions and other software recommendations. Gunnar Steinn suggested merging points closer than ten meters to keep the GPX file slim. I need to figure this out or someone needs to show me how. Also, don’t edit the photos before geotagging because “it will get lost when you reread the files.” (permalink) That hasn’t happened to me yet, but I’ll be working on them after the fact anyway. Update 5/26/2009 – I forgot to link to “Geotagging revisited.” It’s an addendum to this post.